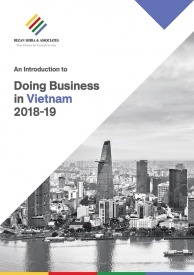 The recently released 2017 Provincial Competitiveness Index (PCI) report, a collaborative effort between the Vietnam Chamber of Commerce and Industry (VCCI) and the United States Agency for International Development (USAID), has revealed a high level of confidence among private firms and foreign investors in the country’s business and economic environment. The resurgence in confidence has been largely driven by a combination of economic reforms, a decrease in corruption, reduced regulatory burden, improved labor relations, and a consistent improvement in the infrastructure quality. The PCI report has been produced since 2005 and evaluates the ease of doing business, economic governance, and administrative reforms by the provincial and city governments to promote the private sector. This year, the report received responses from 10,245 private enterprises in 63 provinces and cities (including 2,003 enterprises, which were established in 2016 and 2017) and 1,765 FDI firms from 47 foreign countries and territories in 21 cities and provinces. fair and effective legal procedures for dispute resolution and maintaining law and order. As for the industries surveyed, the food products sector had the highest share at 15.6 percent, along with fabricated metals, wood products, minerals, and other transport at 14.4 percent, 8.1 percent, 7.6 percent, and 6.5 percent respectively. Quang Ninh has emerged at the top as the most competitive province in Vietnam, with 70.7 points. Its rise in rankings has been largely attributed to strong administrative reforms. The province has consistently ranked amongst the top five since 2013. Da Nang, which topped the rankings from 2013 to 2016 closely followed Quang Ninh with 70.1 points, followed by Dong Thap (68.8) and Long An (66.7), Ben Tre (66.69). Ho Chi Minh City ranked eight, while Hanoi, the capital ranked 13th in the Index. The provinces with the lowest rankings were Bak Kan, Lai Chau, Kon Tum, Binh Phuoc, and Dak Nong. This year, the report identifies major trends in the areas of corruption, administrative reforms, security, land access, labor quality, and overall business environment. the need for commissions to win government procurement contracts. In addition, firms paying bribes dropped from 66 percent last year to 59 percent in 2017, while paying bribes in customs procedures reduced from 56.4 percent in 2016 to 53 percent in 2017. There has also been a decline in the number of firms encountering bribery in land procedures and paying informal charges to inspectors. For land procedures, it dropped from 22.6 percent in 2016 to 17.5 percent in 2017, while for paying informal charges to inspectors, it reduced slightly to 45 percent in 2017 from 46 percent in 2016. 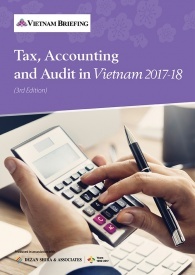 Early last year, the Vietnamese government introduced numerous reforms to reduce the administrative burdens for the private sector. Since the last five years, the reforms for the first time, have shown an improvement in the number of firms spending their time navigating through government procedures. In 2017, only 30 percent of the firms reported spending over 10 percent of their time on government procedures, 72 percent believed that local bureaucrats have become more effective, and 52 percent believed that paperwork has become simpler and less time-consuming. All the responses are an all-time high. As for entry regulations, the average wait time for getting an investment license dropped from 58 days in 2010 to 47 days in 2016 to only 37 days in 2017. In addition, the average time to get a business certificate reduced from 35 days in 2010, to 20 days in 2016, to just 18 days in 2017. For foreign-invested enterprises (FIEs), the share of firms considering entry regulations to be burdensome has reduced from 24 percent in 2016 to 23 percent in 2017. Post-entry regulations also saw an improvement in 2017, with 66 percent of the firms in 2017 spending more than five percent of managers’ work time on government procedures, a reduction of 6 percent from 2016. Land for conducting business operations has become difficult to acquire for domestic and FIEs. The share of businesses that purchased land for their main business premises dropped between 2016 and 2017 and is far below the figures recorded in 2012 and 2013. In 2017, 14.5 percent of the surveyed firms reported that they were victims of theft, with the average value of lost goods being around 15 million VND (US$667). 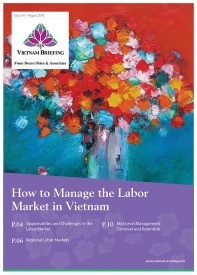 Several firms have reported much greater losses of around 500 million VND (US$22,000). However, overall 56.1 percent of the firms reported that the security situation in their respective provinces are good. According to the FIEs, the local labor quality is inadequate, with 55 percent of FIEs finding it difficult and 19 percent finding it very difficult to hire skilled technicians. Only 31 percent of FIEs believe that the local labor quality is sufficient. For the supervisor and managerial positions, 36 percent and 28 percent of the firms find it difficult and very difficult respectively to find appropriate candidates. In 2017, the overall optimism grew, with domestic firms and FIEs planning to increase their investments and hiring in the next few years. Around 52 percent of the domestic firms are planning to increase the size of their operations in the next two years, an increase of four percentage points from 2016. Forty percent of enterprises are planning to operate at their present size, while only 8 percent are scaling down or closing their businesses. FIEs are more positive than domestic firms, with 60 percent of FIEs planning to increase the size of their operations, compared to 50 percent in 2016. Around 13 percent of the FIEs have increased their investments in 2017, compared to 11 percent in 2016, while 62 percent are planning to hire more employees. Based on the results of the PCI 2017, FIEs in Vietnam tend to be small and export-oriented firms, with Japanese, South Korea, and Taiwanese firms accounting for the majority of the firms. Based on the respondents, 87 percent of the FIEs in Vietnam were firms with 100 percent foreign capital, compared to 90 percent in 2016. 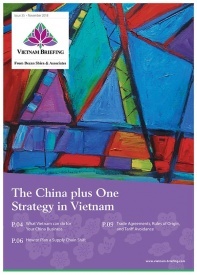 Only seven percent were joint ventures, with private Vietnamese firms or state-owned enterprises (SOEs) as partners. Firms with domestic operations accounted for only six percent of the total FIEs. Manufacturing leads among all sector with 66 percent of FIEs in 2017. The major sub-sectors under manufacturing include fabricated metal products and rubber and plastic products at 7 percent and 6.7 percent respectively. Apparel, which was the third largest sub-sector in 2016 with a share of 6 percent, dropped to fourth with a share of 4.2 percent in 2017. The computer, electronic, and optical products sector replaced it in 2017 with a share of 5.8 percent in 2017, growing from 2.8 percent three years ago. The change in ranking highlights the shift towards high-tech and high value-added products among the foreign-invested enterprises. Following the trend, export markets continue to be the key market for FIEs. 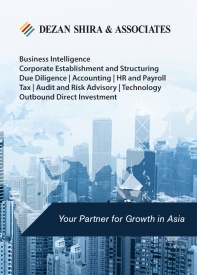 Along with that, other customers include foreign entities in Vietnam and the domestic private sector. The share of FIE’s supply to SOEs and state agencies in 2017 were the lowest at 10.7 percent and 4.3 percent respectively. More than 60 percent of the FIEs are involved in exports, with 33.7 percent of them sending it back to their home country, while 26.6 percent sell it to a third country. 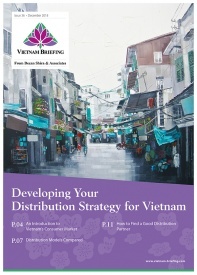 In the domestic market, around 56 percent of FIEs sell their products to other foreign firms in Vietnam, while 41 percent sell it to Vietnamese firms. Only 18.3 percent sell their products to private domestic citizens. SOEs continue to have the lowest share as a supplier to FIEs at 10 percent in 2017. FIEs with at least one private Vietnamese supplier has dropped from 68.5 percent in 2016 to 62.8 percent in 2017. However, it is still an improvement over the 30.4 percent share in 2011. Overseas suppliers still account for a large share, with 49.2 percent of FIEs acquiring supplies from their home country, while 26.6 percent acquiring it from third-party countries. In 2017, Binh Duong led among all the provinces in the PCI Infrastructure Index, followed by Da Nang, Ba Ria Vung Tau, Dong Nai, and Bac Ninh. The lowest ranked provinces included Son La, Nghe An, Dak Nong, Ha Tinh, and Dien Bien. Around 46 percent of the surveyed firms expressed satisfaction with the industrial zone quality and overage, compared to 41 percent in 2016. According to the PCI, 100 percent of businesses now have access to telephones and electricity at affordable prices. Around 78 percent of business rated the quality of telephone service as good or very good, while 78 percent of firms were satisfied with the power supply, an improvement compared to 2016. Internet expansion also witnessed a growth in satisfaction from 57 percent in 2016 to 62 percent in 2017. In 2016, 42 percent of respondents expressed satisfaction with roads. This number declined slightly to 41 percent in 2017. Based on the all the PCI surveys in the past few years, we can see that most of the time, there is a strong correlation between governance and infrastructure. The 2017 PCI report has revealed that government actions such as reducing administrative burdens, streamlining regulatory processes, and improving the overall business environment have had a positive effect on the overall business and economic environment in 2017. The PCI data is instrumental and will continue to be so for the Vietnamese government, as it helps them to make necessary reforms, based on the problems faced by domestic and foreign firms, especially by the SMEs that account for the majority of the economy.